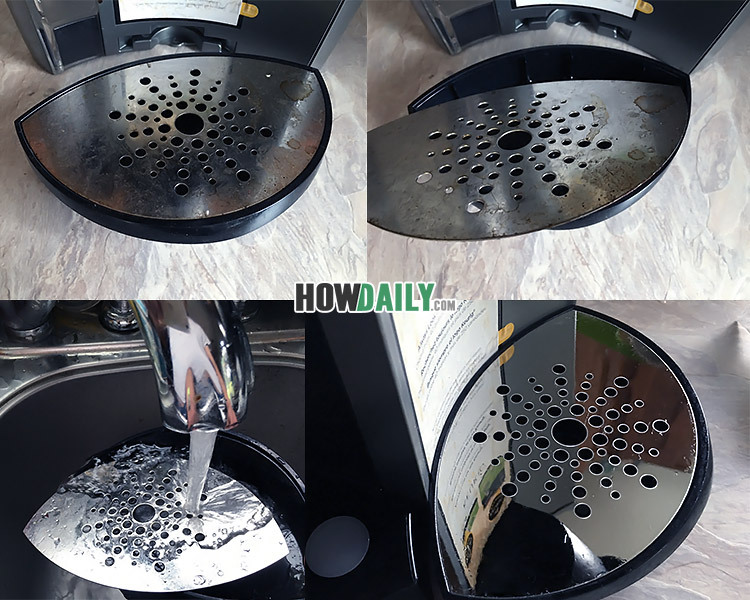 Clean your Keurig coffee maker once a week or so. Keurig cleaning instructions are quite simple. 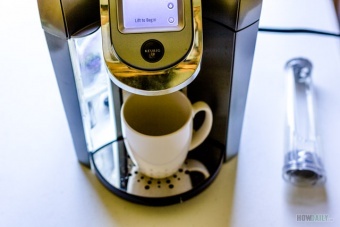 The process is quick, easy and will keep your Keurig in tip top shape. 1. 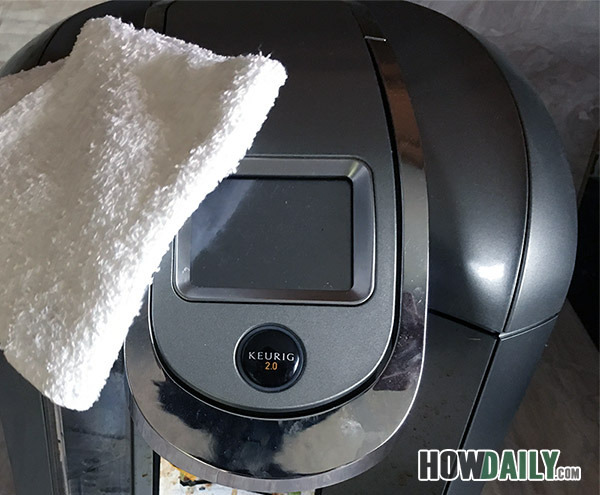 Wipe down the exterior of the brewer with a clean, damp cloth when cleaning a Keurig. Do not submerge it in water. 2. 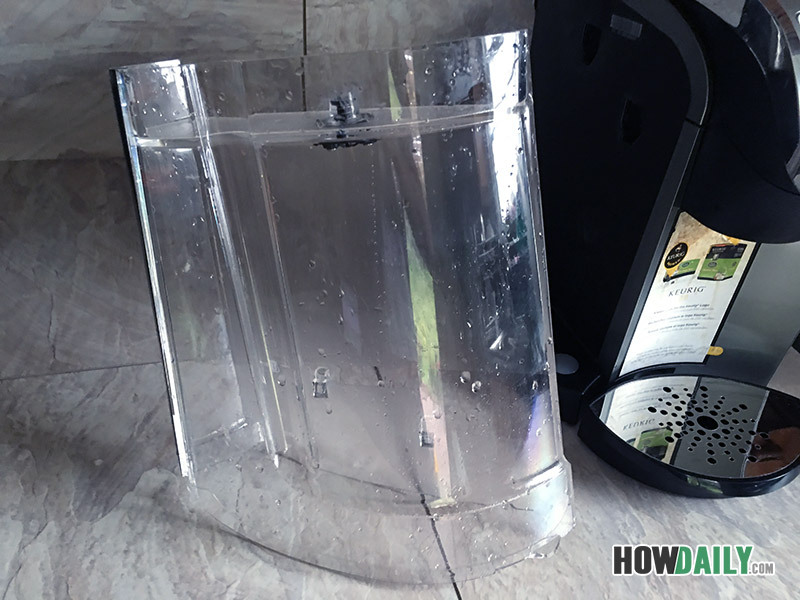 Remove the drip tray that holds your cup during brewing by simply pulling it toward you. Lift the top plate off. Wash it by hand with a clean cloth and mild dish soap. Do not put it in the dishwasher. Rinse it with clear water, dry it and put it back in place. 3. Wash the water reservoir by hand with a clean cloth and mild dish soap. Rinse it thoroughly and put it back in place. Remove the water filter before washing, if your Keurig is equipped with one. Do not dry the water reservoir as the towel may leave lint behind that will clog the machine. You should descale a Keurig coffee maker every three to six months. It is a very important part of Keurig maintenance. This will help the coffee maker last longer and keep it working more efficiently. The Keurig descaling instructions are simple and easy to follow. A bottle of Keurig Descaling Solution. It is available for purchase online or at department stores that sell Keurig coffee makers and supplies. Buy a couple bottles ahead of time so you will have it on hand. Easy access to fresh, clean water. If your coffee maker isn’t set up near the kitchen sink, move it as close to the sink as possible to make this process easier. Keurig Plus coffee brewers come equipped with an indicator that will tell you when to descale as a part of your regular Keurig maintenance routine. The message will simply say “Time to descale the brewer!” and give you two options: “Not Now” and “Continue.” Clean and descale when it tells you to. Do not just hit “Not Now” and put it off. 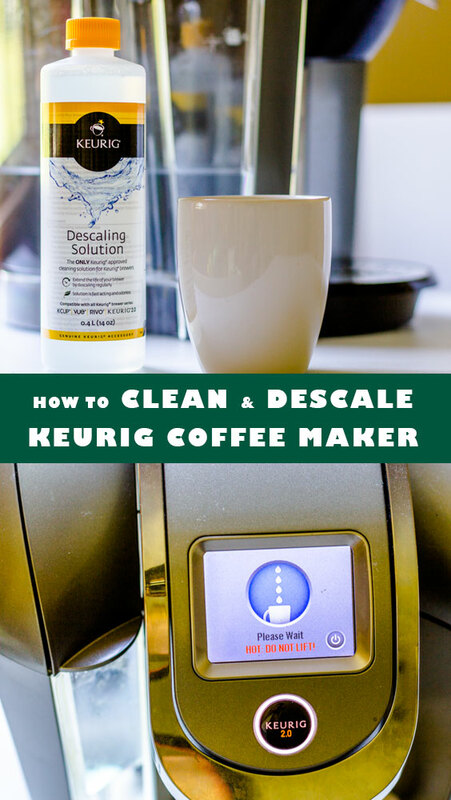 At this point you’ll be asking yourself, “How do I descale my Keurig?” Well, hit “Continue” and follow these simple Keurig descaling instructions. Remove the filter from the water reservoir, if your coffee maker has one. Disable the Auto-off feature, if your brewer has one. Pour the entire bottle of Keurig descaling solution into the water reservoir. Fill the empty descaling solution bottle with water and pour that into the reservoir with the descaling solution. Put the coffee cup in place as though you are brewing a cup of coffee. Lift the handle to make certain there isn’t a leftover coffee pod in there. Set the coffee maker to brew an 8-ounce cup or the largest cup setting possible. Empty the cup when it is full, put the cup back and hit brew again. Repeat Steps 10 and 11 until the “More Water Please” message appears. Leave the coffee maker on and let it sit for 30 minutes. Empty any leftover Keurig descaling solution and thoroughly rinse the water reservoir with fresh, clean water. Fill the water reservoir with clean water. Brew at least 12 cups of clear water to make sure all of the descaling solution is rinsed out. Keurig K10 and K15 coffee makers can’t tell you when to clean and descale them. Make a note on your calendar or set an alert for every three months on your computer or smart phone telling you to descale your coffee maker. It should also be done if the brewer begins to work less efficiently. Pour 1/3 of the bottle of Keurig descaling solution into the reservoir. 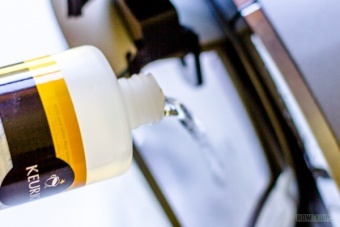 Add enough clear, fresh water to the reservoir to bring it to the 10-ounce fill line. Lift the handle, as though you are going to load a coffee pod, and leave it open for about 5 seconds until the water/descaling solution drains then close it. Set the coffee cup in place and press the “Brew” button to run the solution through. Empty the coffee cup and set it back in place. Pour another 1/3-bottle of Keurig descaling solution into the water reservoir and add water to bring it to the 10-ounce line again. Hit the power button to turn the coffee maker off when the descaling solution begins to run into the coffee cup. Turn the power back on, lift and close the coffee pod reservoir handle and press “Brew” to let it finish brewing. Perform 3 cleansing brews with plain water. 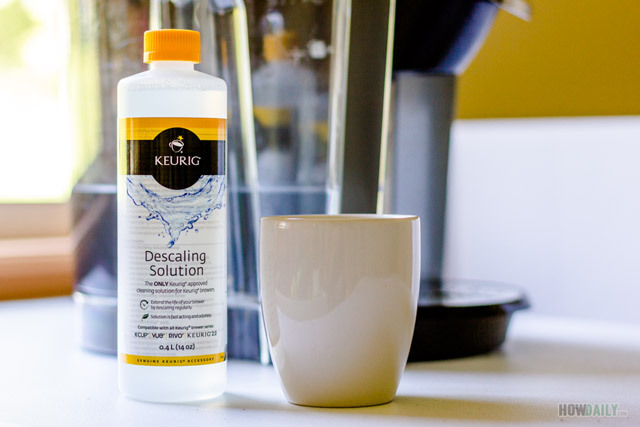 Run 10 ounces of fresh water through each time to make sure all of the Keurig descaling solution is rinsed out. Last time I descaled my keurig I used vinegar but now I see there is a product being pushed. How do I clean it using vinegar? Empty your water reservoir and fill it with distilled vinegar to the Max Fill line. Turn on your machine and take out the used pod (if one still in there). Once the coffee maker is ready, start brewing vinegar to an empty cup. Dump the full vinegar cup to a container or your sink. 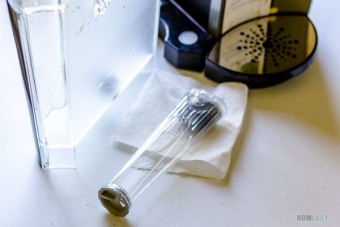 After that remove any remaining vinegar, fill the reservoir with water to the Max and run multiple no pod cycles to fully clean remaining vinegar. How much vinegar do I use in a cup to descale a one cup coffee maker with no water reservoir? Just fill it with vinegar the same amount you would fill with water normally. Repeat this a few times till your machine is clean then re run a couple times with just water to clean of the sour taste.